It’s a battlefield on an ancient plain, with an army encampment at the horizon. A king riding an elephant leads the charge, while, across the stream, dragon cannons are ready to fire. An arrow flies through the sky shot by a warrior on camel-back. Long-haired soldiers charge ahead. A fish jumps out of the stream. This is the work of 12-year-old, Eli, a student I have known for nearly four years. It’s been a year since Eli began his detailed drawing, working here and there, little by little, and on his birthday I celebrate the accomplishment by framing his work. Last year, completing the drawing, adding the detailed watercolor. 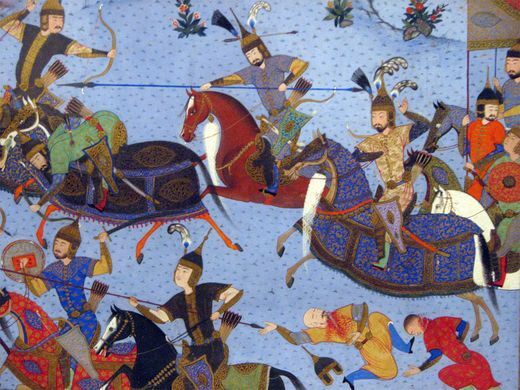 His painting was inspired by 13th-16th century Persian miniature paintings. Persian miniatures are small paintings on paper, much like the illuminated manuscripts in the Western and Byzantine empires. Artists were recruited from bazaars and grouped in workshops, the most prestigious being the royal workshop. One master artist drew the outlines, as lesser artists colored sections and created border designs. The amount of intricate tiny, detail is staggering. 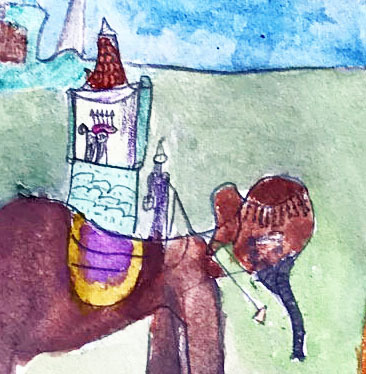 On a similar scale, take a look at the king and his crown in Eli’s painting as he rides in a houdah, the Arabic name for the elaborate seat which protects the rider with a canopy and rail. Our artist here might have experienced a tiny bit of what it was like for the Persian and Iranian artists of the workshops, painstakingly filling in the colors. His soldiers armor is carefully drawn, and difficult to paint without losing information. In much of his work (the beards, the braids, the woman warrior? ), he could expound where I do not understand. Artist statements, next time? Soldier charging; catapult ready to fire. Detail with flag and arrows.